Comic-book superheroes are reaching a wider audience in mainstream pop culture, but not through colorful pages and speech bubbles. It’s superhero movies, like the Avengers series, that have lead to this rise in popularity. But what about the paper stories and comic shops that started it all? Last week, I visited a comic book store, Third Coast Comics, with Julie from the blog, Cozy Corners of Chicago. I have been passing this comic store every few weeks since the beginning of the semester, each time poking at my curiosity—what adventure and magic hid in the stacks of the comics lining the shelves? After entering the store, however, all I found was awkward silence. With no music playing and no privacy to roam the shelves (the store owner sat at the desk watching and waiting for me to steal something), I wanted to buy my comic and leave before anyone could say, “KAPOW!” If comic stores are turning into such uncomfortable environments, it’s no wonder that Amazon is turning the cartoon series into e-books. When I picture comic book stores in my head, I see two things. The first is a bustling scene where kids, teens, and adults fill a store, their chatter mixing with the cool music playing through the store speakers. Whether an underground, indie scene or a mainstream one, there is a large audience present, engaging in the comics. The second scene is quieter. 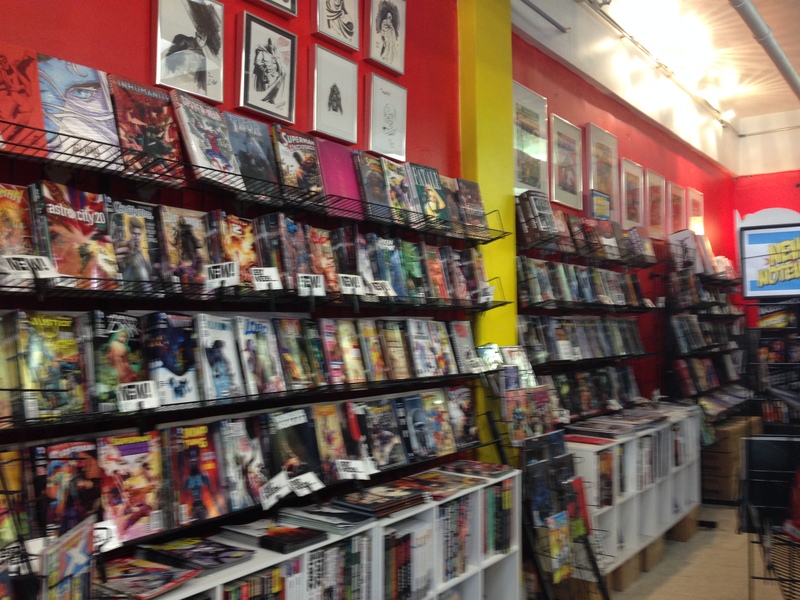 Individuals roam the shelves, leafing and reading through comics before settling on one to buy. A few friends have a quiet debate about the better superhero and comic series. The couches and chairs feel welcoming as opposed to stiff decoration. Neither of these environments were found at Third Coast Comics, leading me to believe that maybe the social appeal of comic books are dead. Movies attract the larger audiences, with trips to movie theaters and movie marathons standing as the source of socially enjoying comic-book characters. The movies also receive the most advertising and publicity. I believe that comics and comic shops can be more than the backbones for exciting, action movies, but like most print today, both need to find new ways to appeal to audiences outside of theatres and media. Our generation has immediate and customizable content available at their fingers tips, so trips to libraries, bookstores, and comic shops become about the experience. Anyone can enjoy a superhero online, but not everyone can experience it online. By becoming more involved in the community—through game tournaments, group trips to Marvel movies, public debates about the better comic-book characters, and relating the conflict in comics to real world issues—comic shops like Third Coast can create more inviting environments, turning comics into something more interesting than a plotline that can be read online or viewed in a theatre. Marisol from Living the Chi Life visited another comic shop on Tuesday. Read about her experience posted Friday, 4-10.